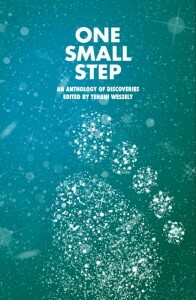 Behold, Amanda Rainey’s cover for FableCroft’s One Small Step anthology! The Table of Contents has an awesome addition: Cat Sparks and her tale, “Daughters of Battendown” join the cast! This entry was posted in fairy tales, News, On Writing: General and tagged "Azathoth" by Edward Pickman Derby, angela slatter, barbara robson, cat sparks, d k mok, Deborah Biancotti, fablecroft, faith mudge, Joanne Anderton, Jodi Cleghorn, kate gordon, kathleen jennings, lisa hannett, Michelle Marquardt, penny love, rowena cory daniells, suzanne j willis, tansy rayner roberts, Thoraiya Dyer. Bookmark the permalink.